I have NEVER had so much fun! Making this trench coat has been one giggle fest after another for weeks! 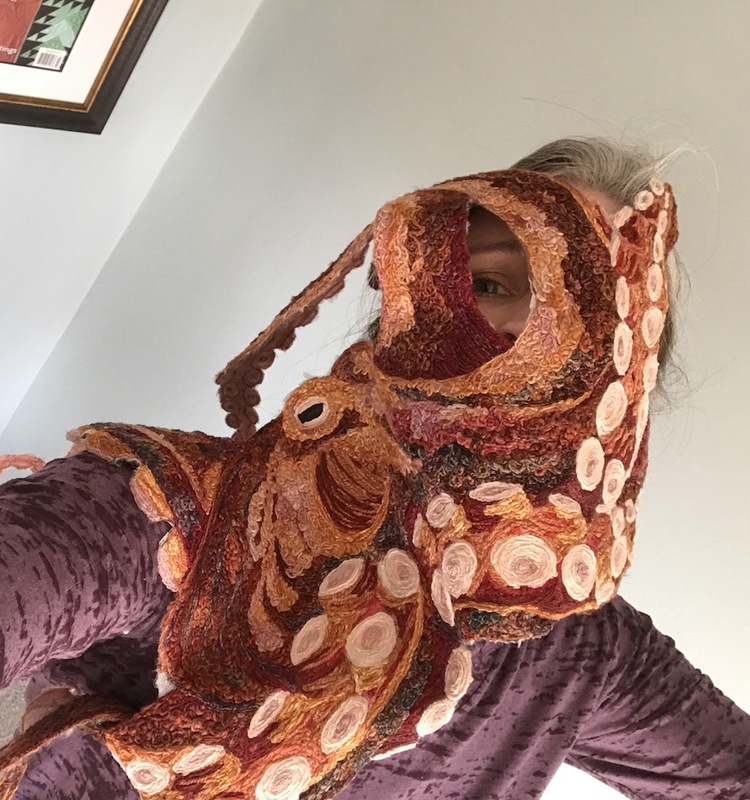 If you know me at all, you really need to picture me wearing this all through the airport, acting like it is totally normal to have 3′ octopus on your a** every day. Like EVERYONE doesn’t have one of these?? What??! Seriously…Im going to lounge casually at the Starbucks counter…sipping my Carmel Macchiato…and be like, “Oh this?” LOL!! I LOVE how it turned out. I may never go back to quilting! 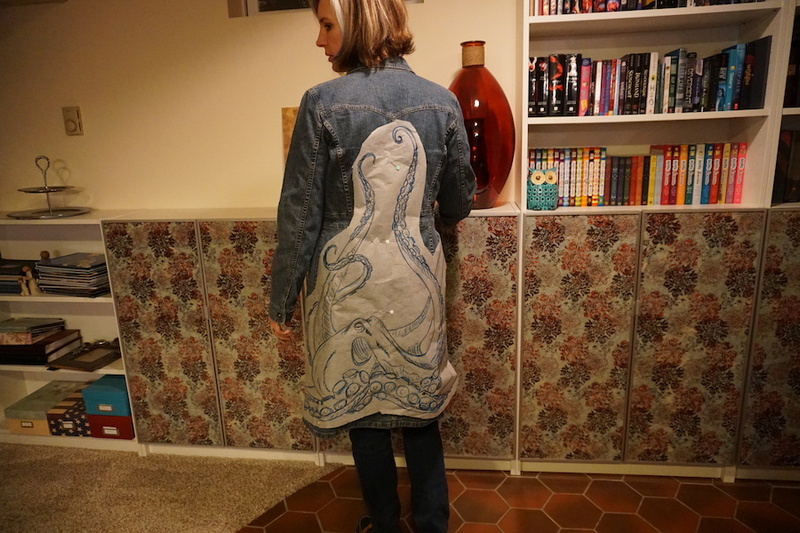 First….get TOTALLY lucky at goodwill and score this DKNY vintage denim coat for $12. Right??! Honestly…you can do this with any garment that you don’t mind having a bit of stiffness to in the end. It is pretty flexible…but not cotton skirt level of flexible. Next, gather your pallet of yarn. You need a range of values and I personally love artisan pot dyed variegated yarn. It frequently has some weird surprises…but if you decide, “This skein is my dark. This skein is my medium”…then even if that yarn piece flashes hot pink or blue or something, while being predominantly deep oranges, it will all work in the end, and be far more of an interesting project overall. These yarns are all “Sock weight” with one “DK weight”….in yarn talk…they are pretty fine. That means…a tremendous amount of overlapping for coverage on a project, but good ability to create fine detail. Of my three A1 yarn couching feet, I am using the smallest diameter one for this size yarn. Next is the drawing…yes…just free draw! It annoys my students sometimes when I say,”I just draw it”. 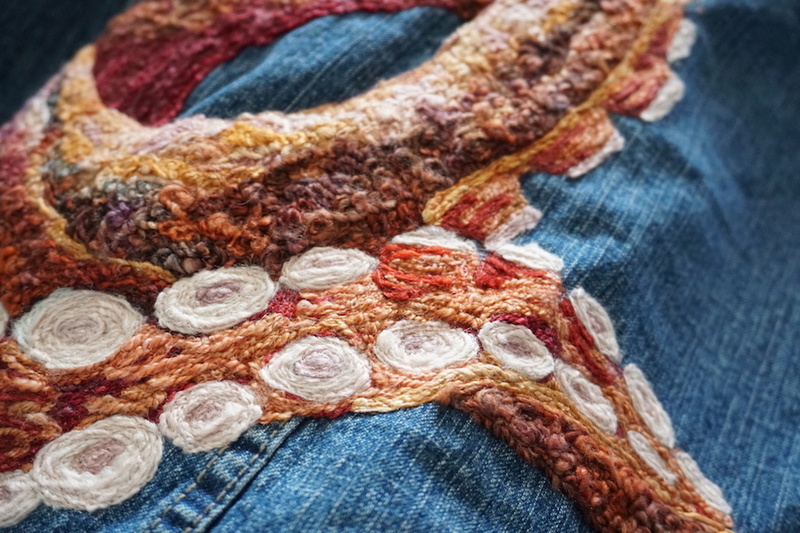 I do a lot of that on my show quilts…but it is just something that comes naturally to me. 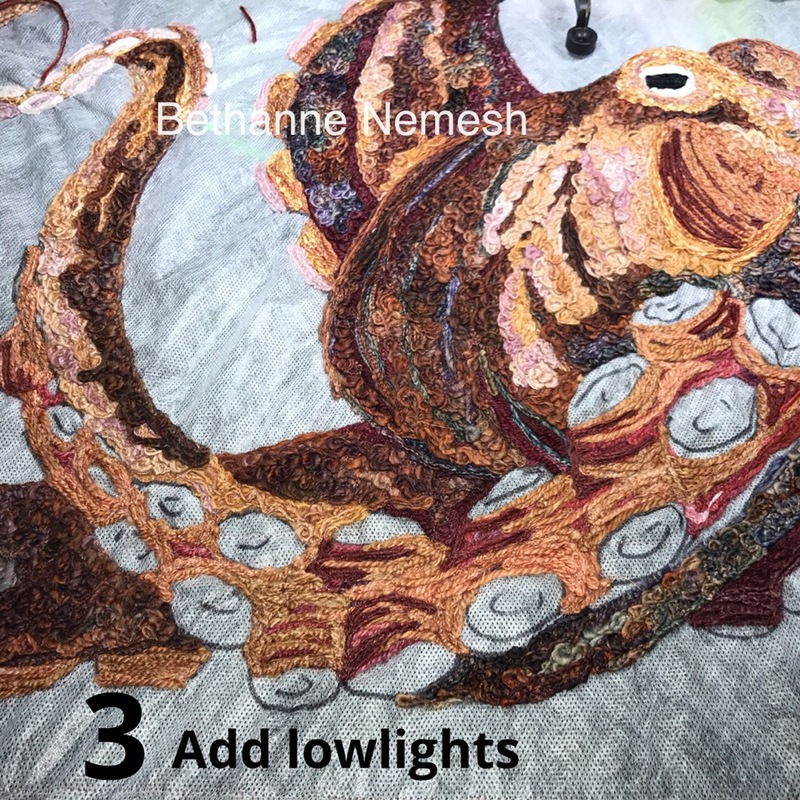 There are options available for folks who want to try pictorial yarn couching though, and are thinking to themselves, “NO WAY can I draw”. Dover Design books are amazing royalty free resources….there is no reason you cannot use, or adapt, a royalty free drawing, and apply some basic shading/coloring to it. Imagine a light source…everything on one side of a 3D object near the light is brighter, on the opposite side is darker. Create deep shadows and high highlights. It is yarn, trust me, it is very forgiving. If you mess up, you just couch another layer right over it. 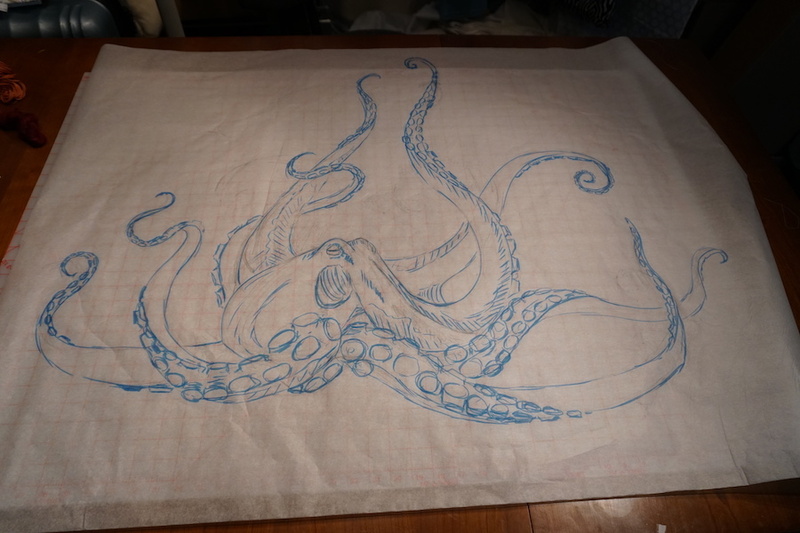 I did a rough pencil sketch, then a layer in blue marker to improve on the lines, then a final black ink right on top of that….which is what got transferred to yardage of wash away embroidery stabilizer. I am couching on my longarm…but a domestic machine is FINE too! I decided that even though the clear thread (which is the thread running through the needle of the machine) will overlap the yarn over and over again, and was likely to hold the yarn couching together once the wash away stabilizer was dissolved…I wanted insurance. 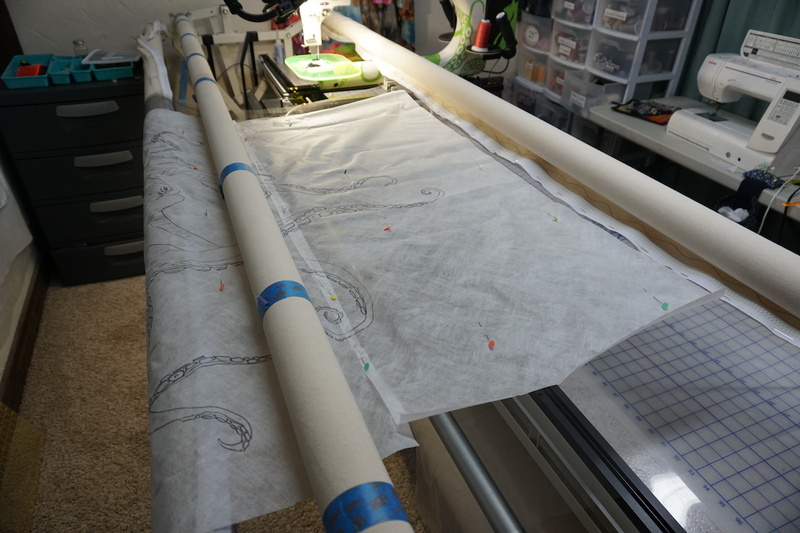 So, this project is layered with a fine smoke colored tulle mesh, mounted on the frame first, then the stabilizer. 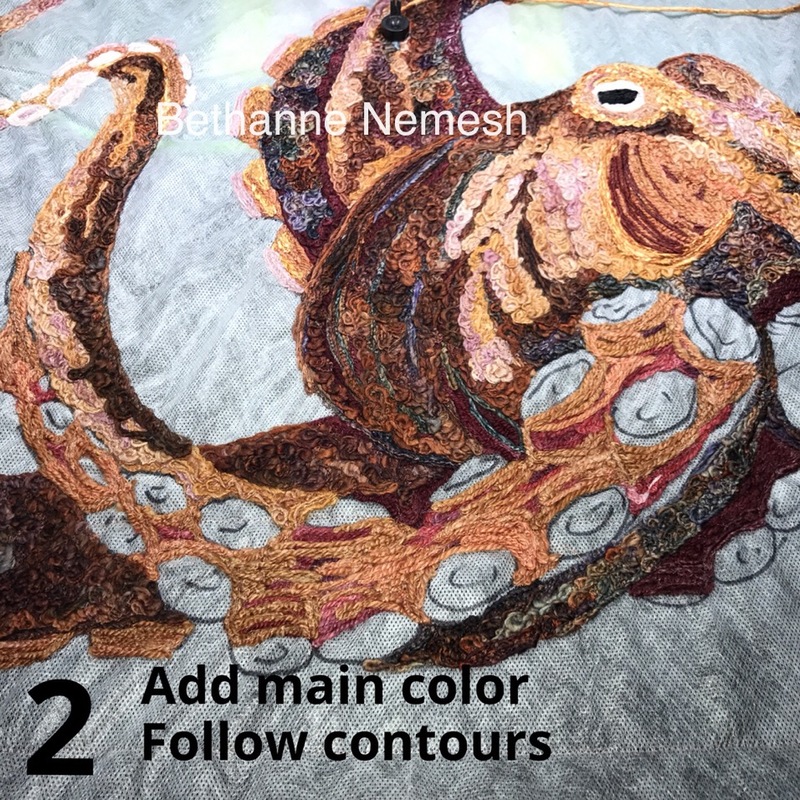 It turns out this was wise….as in the final steps of this project it became obvious that at some color change areas, there was not a lot of overlap, and without the tulle, those pieces would have come away from the body of the project. When yarn couching, you have to work in layers. The layers that are furthest back need to be done first, so that any layer that reads “on top” is the last thing done. 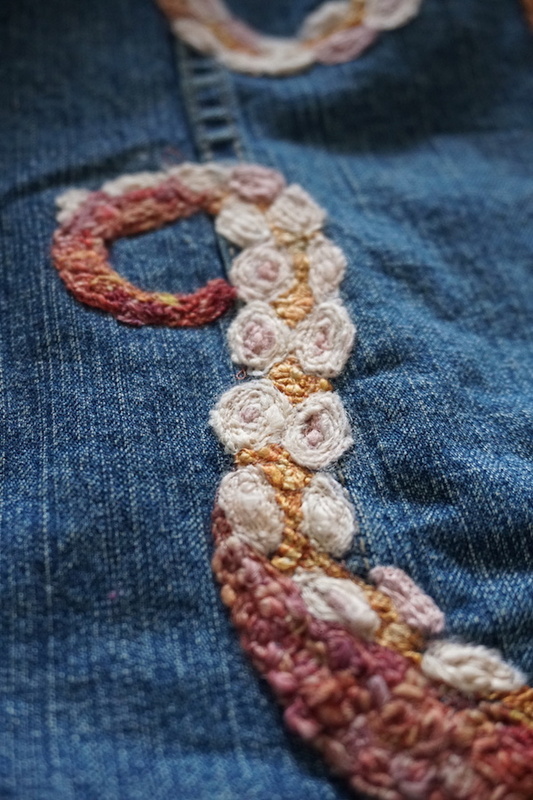 Also, for overall stability of this free standing applique piece, I actually wanted to cut down on the stops and starts. You can couch over anything, so, you can actually travel right through areas that will eventually get another color without cutting the yarn. 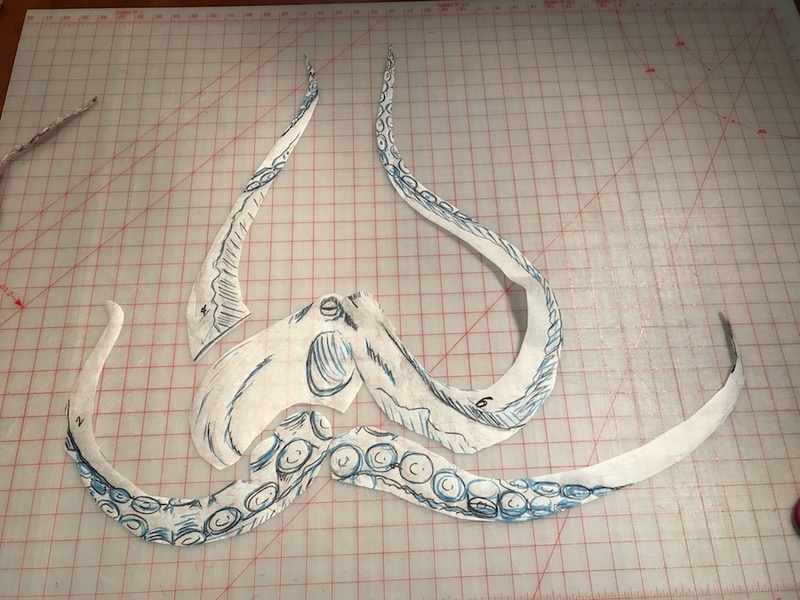 A good example of this is in the tiny suckers at the end of the tentacles. Doing those individually would make them very fragile. So, they are one piece of yarn, with a strand continuing between each sucker, under the orange yarn of the “skin”. Also, to get sparks of color and depth, I use a base layer which, by the end, is often only visible in tiny amounts. These pictures show an area of progression. In any case….keep going until you are done! Now…TRIM! Once I was totally happy, the fun began with unloading and trimming. This isn’t hard at all. Normal fears of trapunto style cut away are eased when trimming the tulle, because the layer of stabilizer is protecting the yarn from the scissors. Also, if you use a sharp pair, you can kind of slither them along the edge of the tulle and it just WANTS to tear. In fact, I did just tear with my hands in a lot of places. Same goes for the stabilizer. 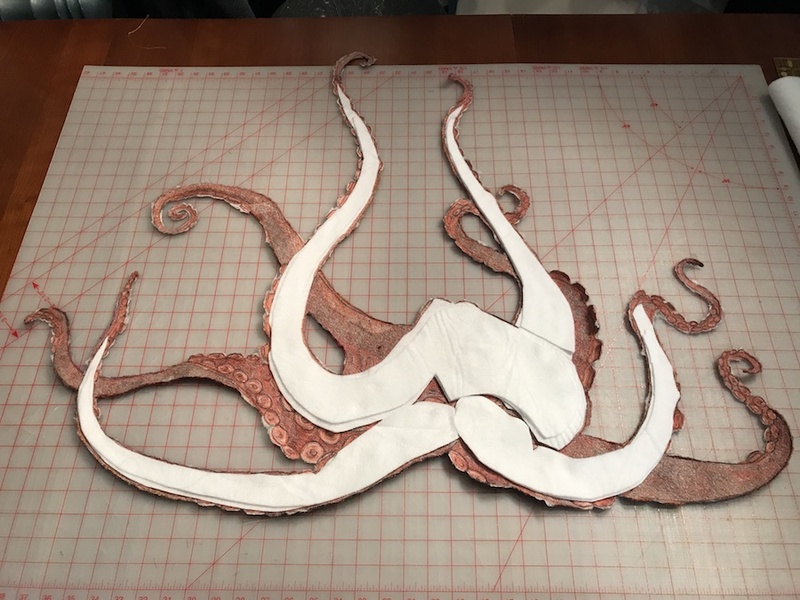 It is SO perforated at this point that I tore it with my hands for the most part…only using scissors in a few inside or delicate tentacle ends. 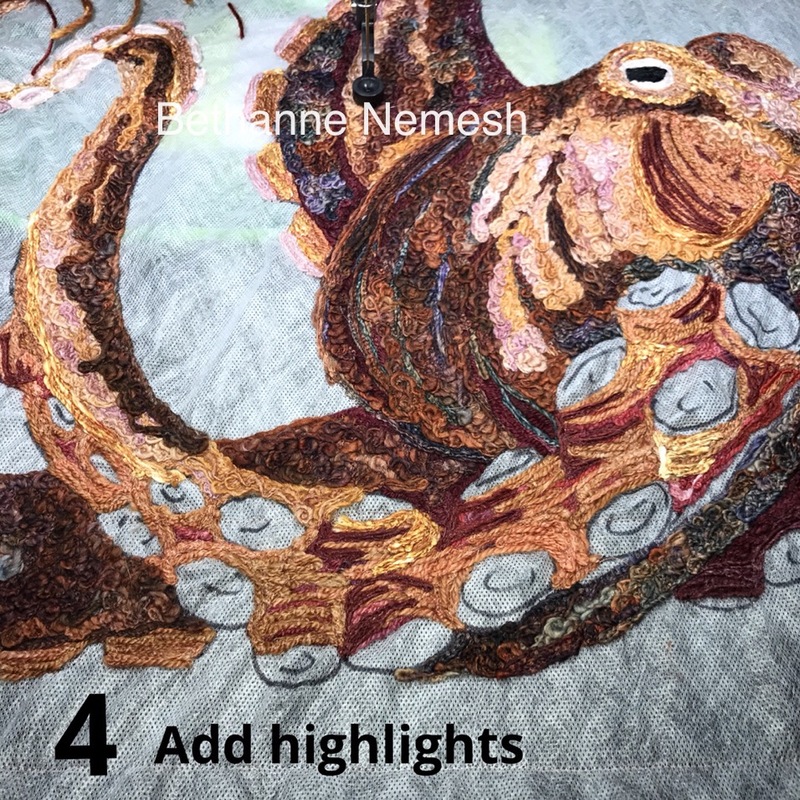 At this point you have a giant yarn appliquÃ© ready to go. And if you don’t take this moment to be a little goofy, you’ll disappoint me. Next, I cut out my original pattern and used it to make batting inserts. My idea here was to let some areas be more 3-D than others. 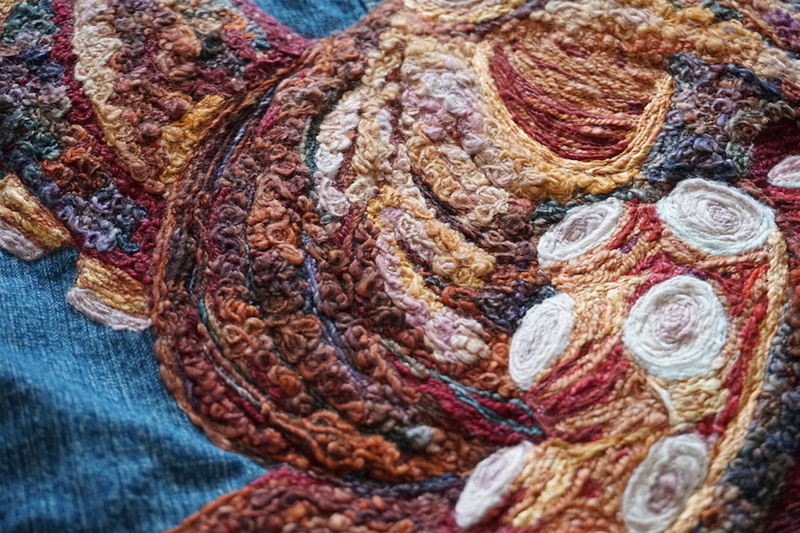 Mostly this was problem solving on my part, as with anything sewn, if an area is uber-microquilted it will “volcano” or “collapse”. The body of my octopus had several of these spots, and I was thinking the batting would fill them in. My final take? Well, yes, they did get filled in, but the trade off is a stiffer area of coat. As a trench coat rear panel, it isn’t a big deal, but on a different garment this would be a definite drawback. So, Im sure I’d be careful about choosing when to stuff/not stuff a piece like this in the future. Next, of course, is attaching it to the coat. 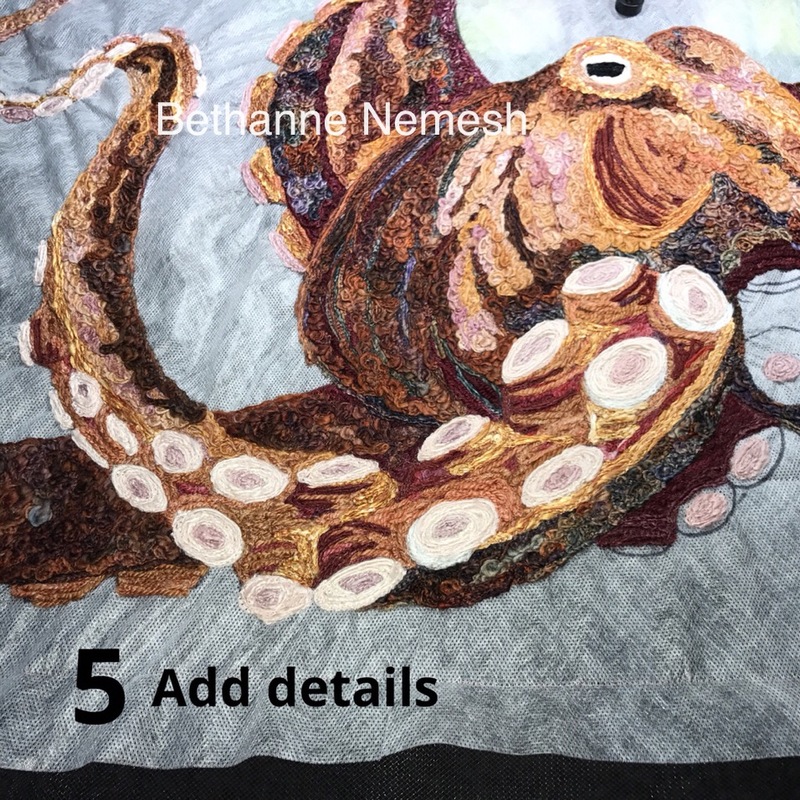 This is done on my Domestic machine, using clear thread. 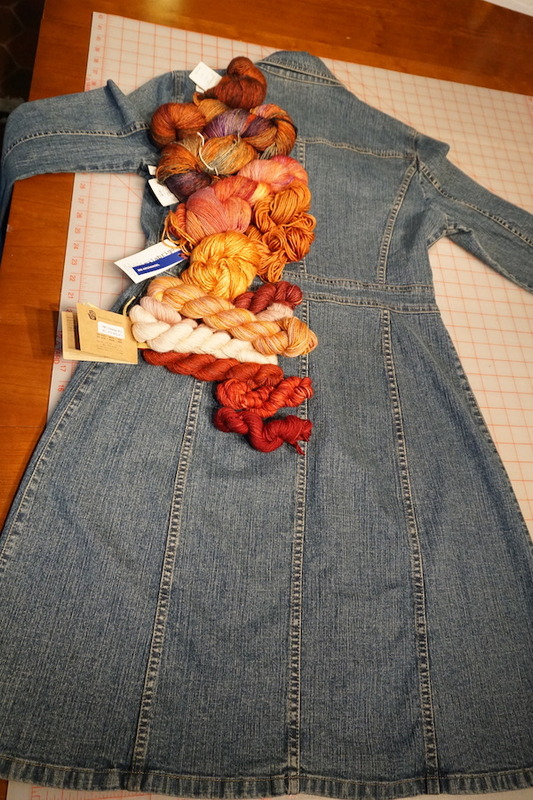 I should give a big shout out to YLI threads for this one…as they gave me a huge spool to play with when I was down teaching at Birds of a Feather. They make three weights of clear..and I am using the finest one. In this whole project, I snapped it maybe 4 times…and this is a VERY bulk project with major friction…so I am VERY pleased with it. Jackets are not quilts. The pieces are not flat. In fact, as a trench coat, several panels are cleverly cut to hug your bum. You can’t just pin the heck out of something this big while laying on a table. You must let it flex around the cut of the garment. 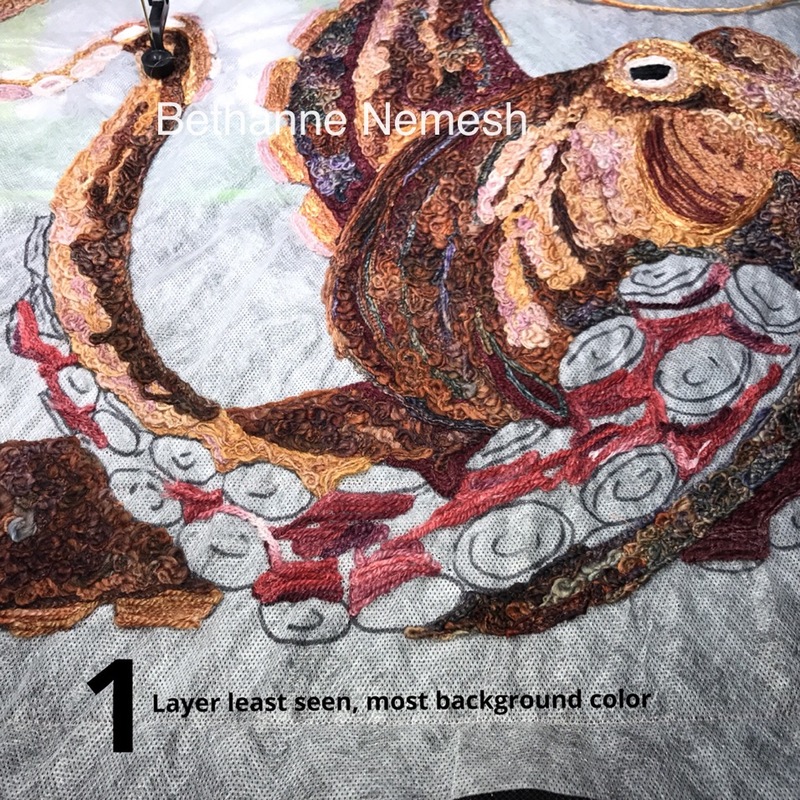 I began working from the center/middle- out, using a free motion hopping foot to re-couch clear over the “deep” areas and outlines of the body parts. I quilted down the non batting pieces a lot, and left the batting backed pieces more puffy. 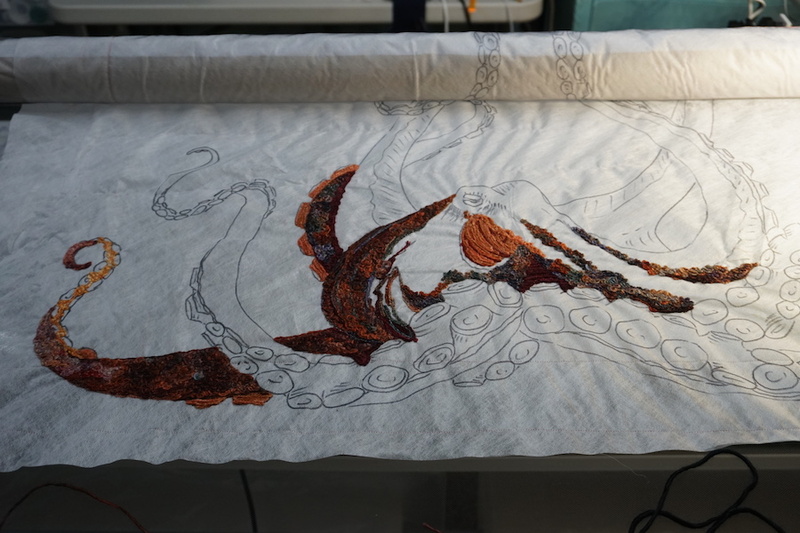 Each tentacle was attached in stages, working in a spiral outward more or less, to let the coat relax around the machine. I was working pretty hard at making sure the coat maintained it’s drape. Last is a good long spa day! Wash out stabilizer dissolves at different rates depending on temperature and how well it is “protected” by overlapping layers as well as brand (I imagine). Let’s just say, you soak gently in a bathtub it until it is well and truly gone, and if, when you dry your piece…it still seems a little crunchy around the edges…do it again. I did take the precaution of putting a few drops of BLUE DAWN dish soap in the water (a classic dyer trick), in case my artisan dyed yarn had any discharge, it wouldn’t redeposit on my pale pinks. Im glad I did, as my water was a faint orange color for several rinse cycles. All that is left is to SHOW THE HECK OFF!! I hope you enjoyed this! I will DEFINITELY be shopping for more clothes to do this to!! What a fabulous one of a kind jacket!!! Thank you for sharing so much of your designs, process and insights! I’m looking forward to more on your blog! 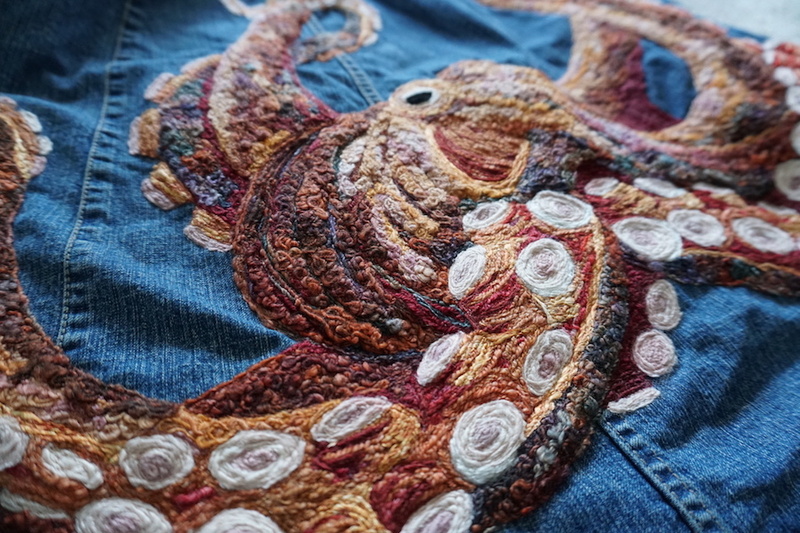 I€™ve got the perfect jacket for this kind of project. Thanks so much for showing your amazing work – it gets my brain cells working. Do you ever teach classes near Seattle Wa? I don€™t have any classes planned currently in that direction, but you are welcome to help organize one! Thanks! Looks fab Bethanne. I’m sure you’ll not go down the street un-noticed in this coat! Enjoy wearing it. Love it!!! I do not know how to do couching, but looks VERY interesting!!! Thanks for sharing!!! Oh Bethanne, You are a blast!